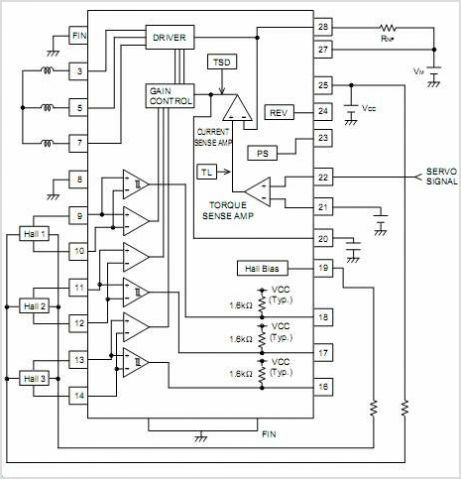 The BA6665FM is a CD-ROM spindle Motor Driver supporting reverse-rotation preventing circuit. It incorporates power save circuit, thermal shut down circuit, FG output, hall bias, etc. The 3-phasefall-wave pseudo linear driving system achieves high-performance and multi-function. By ROHM Co. Ltd.
BA6665FM Pinout will be updated soon..., now you can download the pdf datasheet to check the pinouts ! This is one application circuit of BA6665FM,If you need more circuits,please download BA6665FM's pdf datasheet.